Italy is in a many way great country. Beside the great food and wine, cradle of European civilization and renascence also gave us big amount of amazing music. 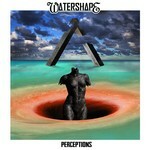 Alike in the case of band Watershape with their album Perceptions. But to be honest, amazing is not good for description. It is too weak. The best way how to describe Perceptions is used these words. Diversity. Group overcome every border builded with almost non-limit genre progressive rock/metal. So we can hear hard and fast song like the Cyber Life, noble rock Beyond The Line of Being, or slow, melancholic Inner Tide, where is also used saxophone. Freedom. Authors of music create really very rich instrumental (and also vocal) side of the album, and use many great enriching – for example passage Pam Pam Param… in Fanciful Wonder. And you can bet, that this part fit there perfectly. Quality. It is probably impossible to say, which member of band made his job better. I tis like you would like to compare Messi and Ronaldo, Both are genial… Watershape has 5 genial musicians. Guitars with big amount of great riffs, amazing drums, keyboards which rule everything, bass on a level of masters, or vocals with wide range and perfect performance. Balance. Together we can found on Performance 9 songs, and again, I can use same words like in rows before. 9 genial pieces. Honesty. Many emotions from wide pallets of human feelings are put into music. Sometimes, you would like to go headbang on concert, sometimes you would like to hide before the whole world. And in case of Cosmic Box #9 you have to think about meaning of life. This is the manual how to create legendary, genial music. Way, how to play true progressive.